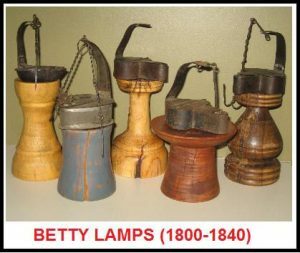 Betty Lamps are part of the earliest evolution in lighting where some real thought was put into the design of the lamp to make it better. In fact, they are said to have got their name Betty from the German word “besser” which means To Make Better. These lamps were commonly used to the mid 1800’s and some date back to the 1700’s. Unlike its predecessor, the Crusie, the Betty lamp has a cover added to the top. Although the greatest improvement is the addition of a wick holder inside the oil reservoir. This allows oil from the wick to drip back into the lamp, saving it, instead of dripping onto the ground. Betty Lamps are typically found made of sheet steel, but are also found in tin or brass. They have a hook on top to hang from or can be sat onto turned wooden stands as shown in the picture to the left. Tin Betty Lamp with Pick for wick and has original wick. Sliding cover on top to fill.